We were treated to a magnificent seventh game of the World Series last night, and I hope you had a chance to watch it. Madison Bumgarner was terrific throughout the series, and then he delivered the knockout blow with five scoreless innings from the bullpen last night. Two ex-Rainiers became World Series champions: Mike Morse and Yusmeiro Petit. Morse had the go-ahead RBI single in the fourth inning last night, giving the Giants a 3-2 lead that stood up as the bullpens dominated the remainder of the game. The Giants would not have been in the Series if not for the long relief work of Petit – especially in that 18-inning game against the Nationals in the NLDS. The game generated a lot of great angles for the baseball writers. I’m linking to the best stories I found today, so enjoy! Here’s Roger Angell on Christy Mathewson, Madison Bumgarner, and Clayton Kershaw. Michael Powell of the New York Times visited Bumgarner’s father in rural North Carolina. Here’s a fun list of the best World Series pitching performances ever. We have another Christy Mathewson sighting, which is one of the great things about baseball: something can happen today that reminds fans of something that happened 110 years ago. Ken Rosenthal got into the mindset of Madison Bumgarner. One of the crucial moments in the game was a spectacular replay-review double play the Giants turned. Grant Brisbee analyzes the play. Included in that post – the second video down – is the official MLB “statscast” which is quite interesting. Another key play came with two outs in the ninth, when the Giants outfield bungled Alex Gordon‘s single into three bases. Should Gordon have been sent home on the play? Jeff Sullivan scrutinized it for Fangraphs. This story from San Francisco has a section on Mike Morse and his contributions. Jay Jaffe of Sports Illustrated looks at the Giants off-season situation and future prospects. The Angels drafted Rainiers lefty Brian Moran in the Rule 5 Draft last year, saw him go down with an elbow injury in spring training and require Tommy John surgery, and now have returned him to the Mariners. So we could see Moran in Tacoma next year, I suppose. The Justin Smoak situation caused Larry Stone to reflect on the worst moves of the Jack Z administration. Free agency starts Tuesday and Ryan Divish posted the (almost) complete list of available players. No baseball until… the Arizona Fall League All-Star Game on MLB Network on Saturday. It’s going to be a long winter, eh? Yesterday the Toronto Blue Jays acquired Justin Smoak on a waiver claim, ending Smoak’s time with the Seattle Mariners. We saw quite a bit of Smoak over the last few years at Cheney Stadium, and he always provided a solid bat in the middle of the Tacoma Rainiers lineup. 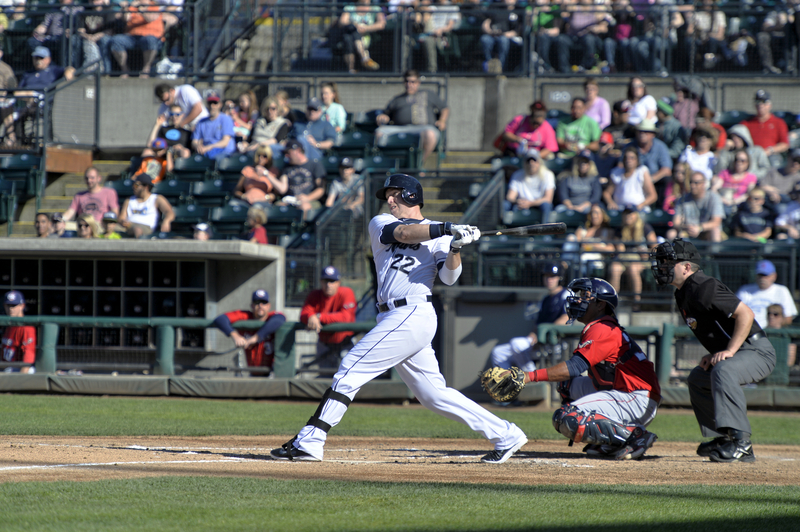 Smoak appeared in games for the Rainiers each of the last five seasons, including a 56-game stay in 2014. Those are pretty good numbers for a first baseman in Triple-A. Unfortunately he wasn’t able to approach this level of production in Seattle, and now he’s a Blue Jay. I enjoyed having Justin on the club. He’s a likable guy and I wish him the best with his new team. Here is some good news: we won the baseball lottery! We’re getting a World Series Game Seven tonight, and it should be awesome. I know I’ll be stationed directly in front of the television starting at 5 pm. Do you have a favorite Game Seven? In recent years, 2001 Diamondbacks-Yankees stands out as a thriller, but my favorite of the last 20 years is 1997 Marlins-Indians. That game saw the Marlins rally to tie in the bottom of the ninth before winning in the 11th. The Indians were loaded with hitting talent and somehow the Marlins won the series. Here is the box score. Roger Angell is 94 years old, a Hall Of Fame baseball writer, and he’s seen more Game Sevens than we have, so let’s start with his musings on tonight’s contest. His thoughts on the players reaction to last night’s blowout are spot-on. It’s a free week at Baseball Prospectus, and their stats have the Giants as a 59% favorite tonight. However, Rob Neyer says you can throw the stats out the window for tonight. Jonah Keri has a Game Seven preview over at Grantland, with four key factors. The road team is a big underdog in Game Seven, Grant Brisbee writes. This story also serves as a quick review of the Game Sevens of the past 35 years. Ryan Divish has the news story on the end of the Justin Smoak era. John McGrath rehashed the trade that brought Smoak to the Mariners. As usual you can find some good tidbits in Bob Dutton’s Mariners notebook. Congratulations to Salt Lake Bees broadcaster Steve Klauke, who won an award! If you were forced to guess which former Tacoma Tigers player shot himself while cleaning his gun, there is one obvious answer, isn’t there? OK that’s enough for today. I need four hours to prepare for Game Seven. The Arizona Fall League is winding down, with just a little more than two weeks left. One of the main events in the prospect-filled circuit is the annual Fall Stars Game, which is coming up this Saturday and will be televised on the MLB Network at 5. It’s sort of a prospect all-star game, except performance in the AFL isn’t really a factor in deciding who plays in it. The Mariners representative is 2013 first round draft pick D.J. Peterson, who is by all accounts a talented young hitting prospect. But as his first full season of professional baseball stretches towards November, Peterson has seen his batting average in the Arizona Fall League drop down to .191. I don’t think the Mariners are concerned about Peterson’s AFL batting average. He’s had a very long first full season, and he’s facing the best pitchers at the very end of it. He’s still likely to see Triple-A at some point in 2015, and if he has a good year possibly Seattle as well. The World Series moves on to Game Six tonight, but baseball was hit with a tragedy over the weekend. St. Louis Cardinals top prospect Oscar Taveras was killed in a car accident in his native Dominican Republic on Sunday. Taveras was considered one of the most talented hitters in the minor leagues, playing in the PCL for Memphis in 2013 and 2014 before reaching St. Louis this year. He never played against the Rainiers – he was out with an ankle sprain when Memphis visited Cheney Stadium in 2013 – so we never got to see him hit in person. The news of his death was stunning. It was reminiscent of another way-too-soon death that hit closer to home for us in Tacoma, when Greg Halman was killed. That news rocked the Mariners organization, and surely the Cardinals are feeling the same way right now. We send out condolences to the Taveras family, the Memphis Redbirds, and the St. Louis Cardinals. Just as I was about to “publish” this post, the Toronto Blue Jays announced they have claimed Justin Smoak off waivers. This ends Smoak’s tenure with the Mariners. I’ll have more on Smoak tomorrow. Bob Dutton’s Mariners Notebook has more on D.J. Peterson, plus a list of the Mariners who will be free agents after the World Series. Ryan Divish has the complete list of Arizona Fall League all-stars. Despite his resurgent 2014 season, Chris Young may not fit into the Mariners 2015 plans. If you are looking for a whole lot of data, here is a PDF of the team-released Mariners Minor League Season In Review. The Atlanta Braves hired Jose Castro as major league Assistant Hitting Coach. Castro was the Rainiers interim manager who won the PCL championship after Daren Brown was promoted to Seattle in August of 2010. Former Tacoma Tigers player and Seattle Mariners coach Mike Aldrete was hired as the Oakland A’s bench coach. Here is a news story on the death of Oscar Taveras. Rob Neyer wrote about some of the others who passed away when they were on the cusp of major league stardom. We’ll be back with a new post on Wednesday looking back at Justin Smoak – and hopefully we’ll have a Game Seven tomorrow night. Every day in the off-season I check the baseball transactions, and today I noticed that some minor league free agents are starting to change teams. A minor league player can become a free agent if he has played six full seasons in the minors without being added to the major league 40-man roster. There are other stipulations for players who were once on a 40-man roster but then taken off of it. One player whose status I am not sure about is infielder Gabriel Noriega, who the Mariners signed from Venezuela in 2007 when he was just 16 years old. The rules are different for international signees, but Noriega was playing in the US in 2008 in short-season leagues and his first full-season league was in 2010. Just because a player is a free agent doesn’t mean he’s leaving. The Mariners sometimes re-sign these guys – Leury Bonilla was a free agent last year and they worked out a way to keep him. The Royals rallied to score five runs in the sixth inning, snapping a 2-2 tie and leading to a 7-2 victory over San Francisco on Wednesday night. That evened-up the World Series at 1-1 and greatly improved our chances of getting a six- or seven-game series. Ex-Rainiers did not factor much in Game Two. Mike Morse was again in the Giants lineup as the DH, and he went 1-for-3 with a single. He’s now 2-for-8 in his first World Series. One fun fact on Game Two: each of the nine starters in San Francisco’s lineup had exactly one hit. According to ESPN, this was the first time in MLB postseason history that had happened. If they just hadn’t used that pinch-hitter, this boxscore would have been perfect. There is no game on Thursday and the series continues Friday-Saturday-Sunday in San Francisco. All games start at 5. Felix Hernandez was picked as the top pitcher in the American League in a poll of front office people. The Mariners have three finalists for the Gold Glove awards. Bob Dutton has all of the finalists at each position, and Ryan Divish has advanced defensive metrics for the Mariners candidates. Here’s a day in the life of Mike Morse as he prepared for Game Two of the World Series (it’s in the video). Another former Rainiers player in the World Series is Yusmeiro Petit, and he had a strange path to glory. Mariners fans can look at the Royals with jealousy, Larry Stone writes. I’m taking a long weekend off and our next blog update will be on Tuesday. After eight consecutive postseason wins, the Kansas City Royals finally took a loss in the opening game of the World Series on Tuesday night. San Francisco beat ’em, 7-1. The game was lacking in the drama department. The Giants scored three runs in the top of the first inning against James Shields, with Hunter Pence connecting on a long two-run homer. Former Rainiers star Mike Morse started as the Giants designated hitter, and he produced an RBI single in fourth inning that made it 4-0. He finished the game 1-for-5. Kansas City was down 3-0 in the bottom of the third when they put runners at second & third with nobody out, but Madison Bumgarner escaped the jam and cruised from that point forward. Bumgarner is a former PCL player who never pitched against Tacoma. Bumgarner made 14 starts for Fresno in 2010, going 7-1, 3.16. Fresno and Tacoma play each other a lot: 16 times each season. Yet in 2010, they played 12 of the 16 games late in the season, after Bumgarner had been called up. The one time they faced each other while Bumgarner was on the club (at Cheney Stadium in June), he was the lone member of Fresno’s five-man rotation who did not start in the four-game series. He spent four days in Tacoma and didn’t pitch – I’m sure he threw a bullpen, and he probably ran some laps. I hope he enjoyed his time in our fair city. Anyway, I digress. Game Two of the World Series is tonight at 5, and the Royals desperately need a win or else they face the prospect of going on the road to San Francisco down 2-0. Bob Dutton has some notes on Mariners in the Winter Leagues. Mariners pitcher Chris Young was named the American League Comeback Player of the Year. This award is voted on by the players. Former Tacoma Rainiers manager Steve Smith was let go from his job as third base coach for the Cincinnati Reds. Yesterday Hall of Famer Old Hoss Radbourn – who died in 1897 – returned from the grave to preview the World Series. Or as he calls it, the World’s Series. This is fun: Baseball America unearthed a Q&A with Hunter Pence from when he was in Double-A in 2006. We survived a baseball-free weekend (and for most of us a bad football weekend) and now we look forward to the World Series, which gets underway in Kansas City on Tuesday night (5:00 Pacific on Fox – all games will start at 5 and are on basic Fox). The main story of the series is that both teams qualified as wild cards. Kansas City finished behind Detroit in the AL Central, and the San Francisco Giants were runners-up to the Dodgers in the NL West. Each team had to survive a one-game wild card play-in game, and then win two full series to advance to the title round. This is exactly the opposite of what MLB was shooting for when they switched to the one-game wild card playoff last year. The goal was to create an easier path to the World Series for the division winners, and make it tougher for the wild card teams to advance. They succeeded in the goal – it is definitely tougher for wild card teams to advance now – but that doesn’t mean it can’t happen. This year’s World Series is Exhibit A. Both teams have played exciting ball throughout the postseason, and I think we can count on that to continue in the Series. What I am hoping for is something that has not yet happened in the 2014 MLB postseason: a series stretched out to full length. No losing team has won more than one game in a series yet in this postseason. It’s time for that to change: I’m hoping we get to at least six games. And if we can get to a Game Seven, well, that’s the best our sport has to offer. KANSAS CITY: pitcher Jason Vargas is scheduled to start Game Four on Friday night. Raul Ibanez is with the team but is probably not going to be on the active roster. SAN FRANCISCO: infielder/outfielder Mike Morse is probably going to get starts as the DH in the games played at Kansas City. Yusmeiro Petit is the long man in the bullpen. The Giants also have state of Washington natives Tim Lincecum and Travis Ishikawa, though neither of them played for Tacoma. Mariners pitcher Taijuan Walker has left the Arizona Fall League after just two starts, rather than the four or five that the team was hoping he would make. Fortunately this is not injury related. Walker reportedly feels great and is 100% healthy; he just had a need to go home to California according to the report linked below. I’m hearing that this is no big deal and Walker will be ready to go for spring training. Bob Dutton has the official word on Walker leaving the Arizona Fall League. Mariners pitcher Chris Young was voted by his peers as the American League Comeback Player Of The Year. Both Larry Stone of the Seattle Times and John McGrath of The News Tribune have columns on Federal Way’s Travis Ishikawa and his walk-off homer to win the NLCS. McGrath writes that the World Series should be a good one, and may the best second place team win. Everybody’s favorite band named after a local freeway exit has reunited. Honk as you pass exit 108! If you are an ESPN Insider, Buster Olney’s World Series preview is an excellent overview. SB Nation baseball writers asked themselves the question, which World Series would you time travel back to see? If I could time travel to see a World Series, I would go to 1926. Cardinals – Yankees. Sportsman’s Park, Yankee Stadium. St. Louis wins in seven. The Grover Alexander vs. Tony Lazzeri battle in the 7th inning of Game Seven remains one of the most famous moments in World Series history. Rogers Hornsby. Babe Ruth. Lou Gehrig. Miller Huggins. Waite Hoyt. Herb Pennock. Urban Shocker. Branch Rickey. And the whole thing ends when Ruth gets caught stealing second while representing the tying run. I would convince Graham McNamee to hire me as help in the broadcast booth during the games. I would spend all of the money I made on cigarettes – not to smoke, just to try to get mint condition Babe Ruth, Lou Gehrig, and Rogers Hornsby baseball cards. I’ll smuggle the cards back to the current day, sell them, and buy an island to spend my winters on. Pretty good plan, eh? The Kansas City Royals and the San Francisco Giants advanced to the World Series, and each team was spurred by a player with local ties. Kansas City completed a four-game sweep of Baltimore on Wednesday, with former Rainiers and Mariners pitcher Jason Vargas earning the win in the deciding game. Vargas pitched 5.1 innings and allowed just two hits and one run in the Royals 2-1 victory. Later on Wednesday, San Francisco reliever and 2010 Rainiers pitcher Yusmeiro Petit tossed three scoreless innings and earned the win in a Game Four victory over St. Louis. The Giants polished off the Cardinals on Thursday night, 6-3. Former Rainiers and Mariners infielder/outfielder Mike Morse hit a pinch-hit, game-tying home run in the bottom of the eighth inning to make it 3-3. Then in the bottom of the ninth inning, Federal Way High School (Class of 2002) product Travis Ishikawa hit a walk-off three-run homer to give the Giants a 6-3 victory. Ishikawa played at Cheney Stadium this year, as a visitor for the Fresno Grizzlies in a series July 11-13. A longtime off-the-bench player in the majors, he opened the season with the Pirates, was released in late April, signed by the Giants to a Triple-A deal, and then promoted to San Francisco in August. He’s played all or parts of seven years in the majors, and 11 years in the minors. I must admit, I forgot about Todd Pratt. Now we have a long wait for the World Series. Game One is on Tuesday in Kansas City. We’ll have some sort of preview for you on Monday. The folks at MiLB.com have their Mariners minor league all-stars, with lots of commentary from Director of Player Development Chris Gwynn. There is some good stuff in here. Bob Dutton has an overview of where Mariners landed on the various Baseball America league top prospect lists. Here’s how Mike Morse prepared for the biggest hit of his career. Former Rainiers pitcher Yusmeiro Petit is gaining a lot of respect in San Francisco. 2005 Pacific Coast League MVP Andy Green (who was with the Tucson Sidewinders) was named third base coach of the Arizona Diamondbacks. New Diamondbacks manager Chip Hale was the Tucson manager when Green won the MVP. John McGrath recalls his experience covering the 1989 Earthquake Series. The Rainiers Team Store received a brand new shipment of those retro hats you guys love so much – including a new Tacoma Cubs model. Here’s the direct link. You are currently browsing the Booth, Justice and the American Pastime blog archives for October, 2014.